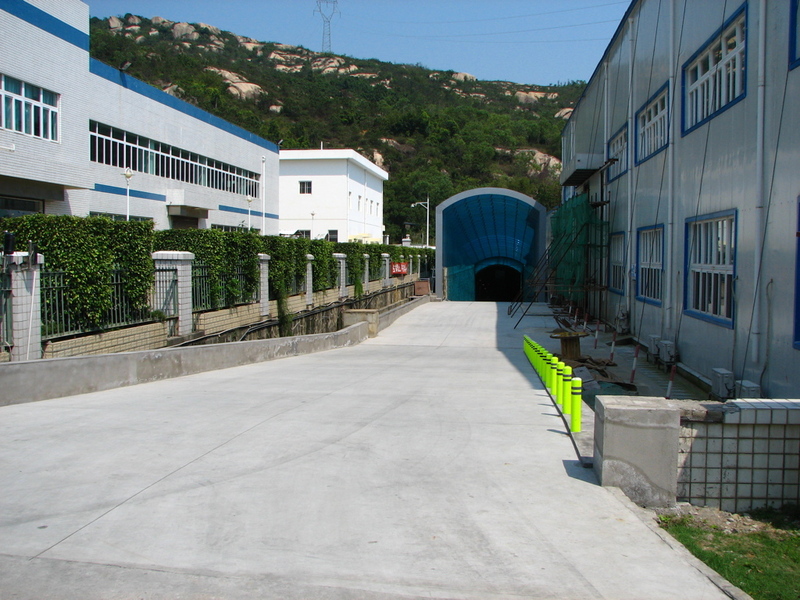 The entrance portal to the tunnel, between the project offices (left) and the Service Assembly Building (right). Daya Bay Hall, closest to the tunnel entrance, future site of two antineutrino detectors. 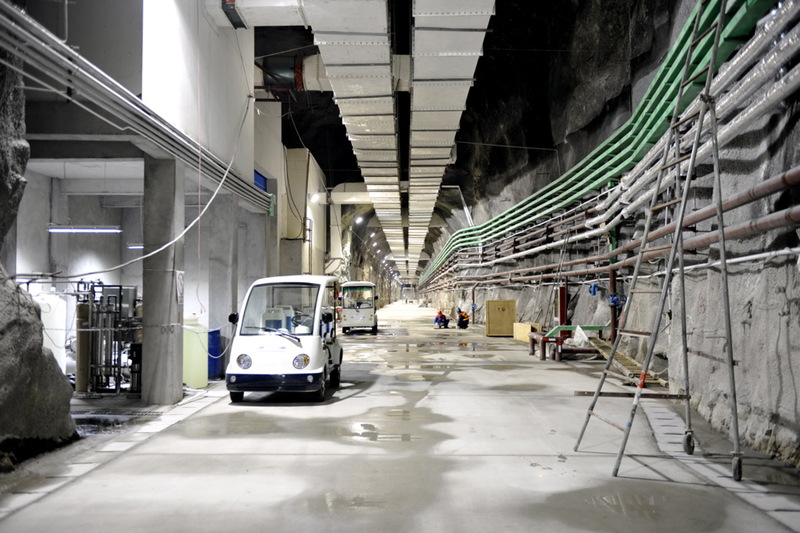 Inside the tunnel near the Liquid Scintillator Hall, where the detectors will be filled. Daya Bay, China -- After about two and a half years of excavation, the entire system of tunnels, measuring a total length of about three kilometers, is complete. Four of the five halls have also been excavated, and work has just begun on the fifth, the Far Hall. Construction work in Daya Bay Hall (middle right) and the Liquid Scintillator Hall has also been completed, and equipment is starting to be installed. Crane rails are being assembled in Ling Ao Hall, and contruction of its auxiliary rooms has begun. 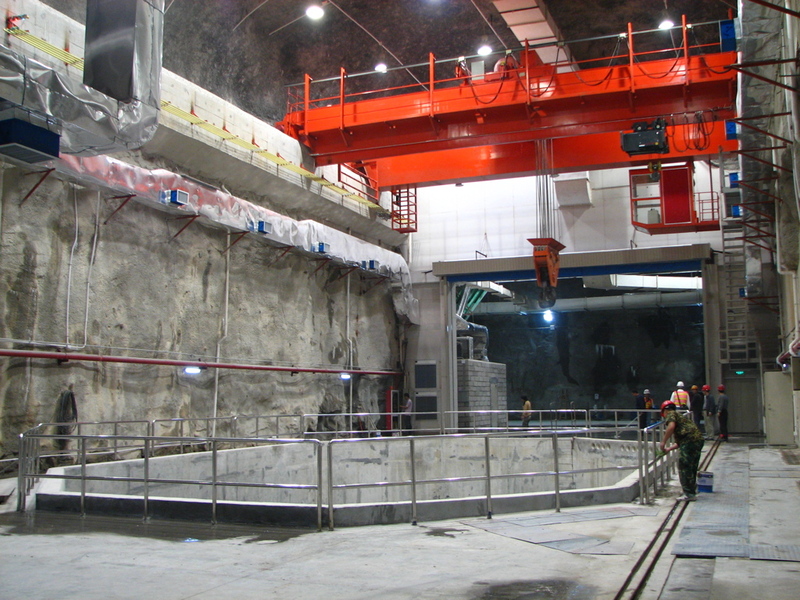 Just outside the tunnel entrance in the Service Assembly Building (top right), the first two antineutrino detectors are being assembled (bottom). Components have been shipped in from participating institutions around the world or fabricated by nearby factories. We at Berkeley have provided the photomultiplier tubes, which we have tested before sending them to Daya Bay, and the hardware for mounting them along the inside of the detector. 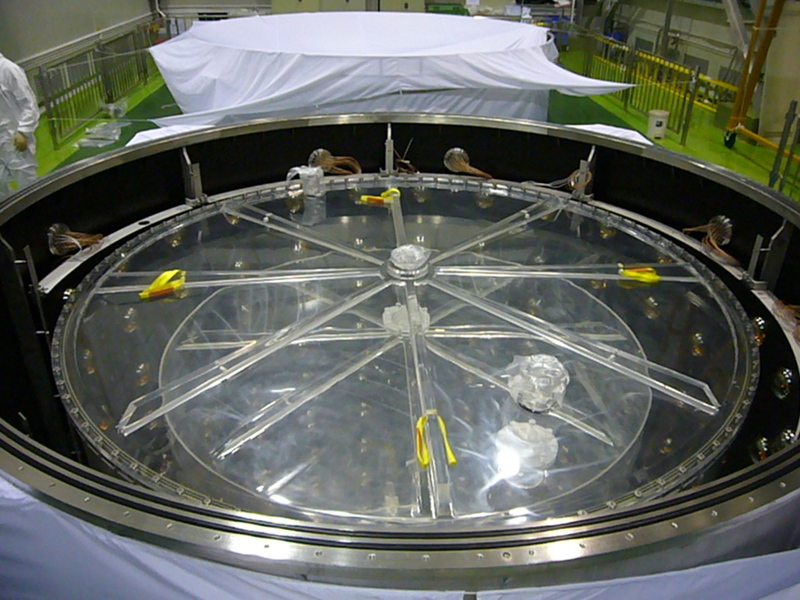 Once the detectors have been assembled, they will undergo rigorous testing with the Daya Bay data acquisition system in order to ensure proper performance before commissioning. Only after they pass this full-scale system test will they be transported into the tunnels. Then, they will be filled in the Liquid Scintillator Hall. Finally, they will be taken to the nearby Daya Bay Hall for commissioning and cross calibration. Excitement runs high in Daya Bay and at home in Berkeley as we look forward to the completion of construction. Both inside and outside the tunnels, members of the international collaboration are very busy preparing for the experiment.